Victoria Pridemore, the associate director of military and veterans student services, stepped down from her post last month, a departure the University did not initially announce publicly. The departure of a top veterans affairs official will leave the University’s veterans office with just three full-time employees – none of whom are veterans. Victoria Pridemore, the associate director of military and veterans student services, stepped down from her post last month, a departure the University did not initially announce publicly. Veteran student leaders said her departure is concerning because it appears to them that a dedicated leader and advocate was displeased with the direction of the office. Pridemore will remain on campus to complete her master’s degree in business administration in the business school. The search for the next associate director has not been launched yet, officials said. Veteran student leaders said this is the first time in six years that there are no veterans working as full-time staff in the veterans affairs office – an issue because veterans often feel comfortable talking to other service members about issues they face. Pridemore served in the Army National Guard and was off campus for a year after being called up for active-duty service in October 2016. Pridemore did not return a request for comment. Veterans said the office is now smaller than it has ever been since the Veterans Accelerate Learning Opportunities and Rewards program, the University’s central academic and career veterans program, was launched in 2013. Danielle Lico, the associate dean of students for student administrative services, said officials will post a job opening for a new associate director as soon as the required human resources processes are completed. A search committee will include student veterans as well as other “stakeholders,” she said. She declined to say when the search committee would form. “During this time, I remain confident that the three full-time staff members, graduate student and a team of [Department of Veterans Affairs] work study students will continue to provide excellent service to our veteran and military affiliated population,” Lico said in an email. Andy Sonn, the director of the Military and Veteran Student Services office, will spend about 10 hours a week in the Military Community Center, the townhouse for student veterans on F Street, to get feedback and to be available for meetings, Lico said. In September, veteran leaders were alarmed by a number of departures in the office and a lack of vision for future programming. Officials announced they would conduct a review of the office this semester to develop a strategic plan. Lico said the office review is ongoing and will finish at the end of the semester. Short-term items to improve the office’s work will begin to be implemented next spring and be shared with experts in the field of military education for feedback, she said. 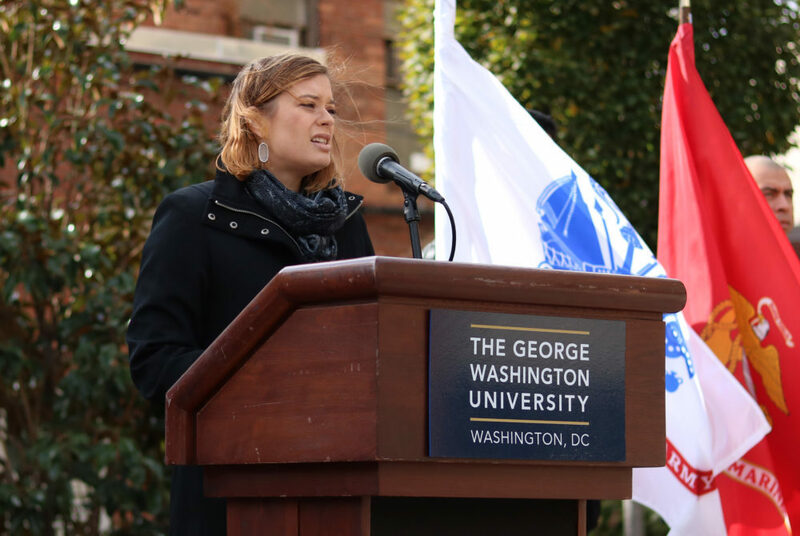 “The departmental review committee has members from the GW student veteran community, faculty and key offices who work closely with student veterans,” she said. Tyler McManus, the former president of the GW Veterans, a student-run advocacy group for veterans, said Pridemore’s departure was another indication, after previous staff departures over the summer, that the Division of Student Affairs doesn’t have a clear plan for the future of the office. “It feels almost as if everything we do is being pushed to the side or on the back burner in order to do something new and DSA doesn’t really know what that is,” he said. But McManus said the review seems mostly to be surface level so far and its objectives don’t seem to be substantial. McManus said Lico was present at the first meeting to determine how the review would be conducted but that no top administrators – including Vice Provost and Dean of Student Affairs Peter Konwerski – have been present at any other meetings. “If they were truly serious about it Danielle would be in there or Peter would be in there at every meeting, not just one, to show they are sincere in their actions and not just trying to appease the larger audience, which is what it seems like they’re doing,” he said. Yannick Baptiste, the alumni relations director for the GW Veterans, said the office has now shrunk to the size that it was about four years ago when the veteran population was smaller and major benefits programs like the Yellow Ribbon program had recently started at GW. There are now more than 1,800 veterans at GW, according to the GW Veterans website, up from about 500 in 2013. “You can see that this particular office has seen a pretty large devaluation in the last few years,” he said. Baptiste said GW should make sure that Pridemore’s replacement is a veteran because students will need to turn to staff members in the office who understand their experiences. He said veterans with non-academic issues feel more comfortable talking to another veteran and that former service members often went to Pridemore to talk through struggles in their GW experience. Tommy Elms, the director of strategic engagement for GW Veterans, said VALOR has partnerships with outside veterans groups that could suffer in Pridemore’s absence because she was well connected. At the end of November, the Military Times ranked GW No. 98 in a list of best four-year universities for veterans. GW’s standing has plummeted 67 spots since former Associate Provost for Military and Veteran Affairs Mel Williams left his position in early 2016. The position wasn’t refilled. Elms said the veterans rankings aren’t reflective of the strength of the University’s program because funding plays a disproportionate role in determining where a university falls. But he said if the program continues to drop in the rankings, it will affect the reputation of the program. “When you’re a 21-year-old kid who is on deployment and you want to get out and go to college, you search best colleges for veterans,” he said. Annie Dobler and Sarah Roach contributed reporting.